Chinua Achebe, who has died aged 82, was one of the world's greatest literary icons of all time. The novel that made him was his first, Things Fall Apart. Now considered a classic, the book explored the way an African society - Igbo people of Eastern Nigeria - responded to the exigencies of its encounter with the West. Over ten million copies of the novel has been sold worldwide and it has been translated into 50 languages. Achebe's writing, whether novels or short stories evoked his powerful story-telling skills, drawing literary sustenance from folklore, social realism, as well as from legends, jokes, riddles, and, especially, proverbs. "Proverbs," he told us in Things Fall Apart, "are the palm oil with which words are eaten." An ardent Pan-Africanist, Achebe often decried the way the West assumed it has cultural superiority over Africa. He said his one big message is that Africa was not a vacuum before European came to the continent. "That culture was not unknown in Africa, that culture was not brought to Africa by the white world." In 1975, Achebe delivered the University of Massachusetts' annual lecture, using the opportunity to lampooned Joseph Conrad's Heart of Darkness. Achebe said the book reinforced a racist view of Africa by emphasising the continent's image as a place of negation that makes Europe's "spiritual grace manifest." He later expounded on these thoughts in his Racism in Conrad's Heart of Darkness. His criticism of Conrad drew condemnation from many western scholars, Olof Rosencrantz, a senior Swedish critic once said of Achebe: "Europe and the west are in trouble if the New World order advocated by this mild mannered African is allowed to occur". Achebe also criticised Third World writers he believed had sold out to western critics- notably V.S Naipaul. "I have mentioned Naipaul again and again," he said. "And I'll mention him again as the case of a brilliant writer who sold himself to the West. And one day he'll be rewarded with a Nobel Prize or something." However, many admirers of his work believe Achebe's uncompromising negative criticism of eminent western writers stood against him and the Nobel Prize for literature even though he had been nominated several times since 1972. But in 2007, he was awarded the Man Booker International Prize, for his decades long contribution to literature. His latest lectures and autobiographical essays were published in The Education of a British-Protected Child (2009). As a child, Achebe was moved by the Christian message, especially the hymns, and even the poetry of the litany. Simultaneously, he was also awed by the rich Igbo traditional religions that the missionaries were trying to suppress. Achebe explored these childhood experiences in his writings. Recalling that the boundary between Western and the traditional Igbo religions had very many crossings. "We sang hymns and read the Bible night and day," he said. "On the other, my father's brother and his family, blinded by heathenism, offered food for idols. What I do remember was a fascination for the ritual and the life on the other arm of the crossroads." Achebe believed the things that mould him into a versatile storyteller were curiosity and the distance imposed by his encounters with both Christianity and Igbo traditions. "The distance," he said. "Becomes not a separation but a bringing together like the necessary backward step which a judicious viewer may take in order to see a canvas steadily and fully." It was this canvass that Achebe created and displayed for readers in his works. Born on November 16, 1930 in Ogidi, Eastern Nigeria. He was christened Albert Chinualumogu, but he dropped the first name, and took his first name from the last at university. His father was Isiah Okafor Achebe a teacher who converted into Christianity. His mother was Janet Anaeneche, the daughter of a blacksmith from Umuike village. As the youngest son, Achebe was quite handy as the child available to perform household chores. He often helped his mother in feeding the family guests and through this was exposed to the conversations of visiting elders; he heard the village gossips; he noted the intrigues and the tribulations of the missionaries. After primary school, Achebe attended the prestigious Government College Umuahia, on a scholarship. The school's library exposed the young Achebe to the world of literature. In 1948, after only four years of secondary school, Achebe won a scholarship to study medicine at the newly established University College Ibadan, Nigeria's first university and then an affiliate of the University of London. Ibadan marked a turning point in his life; it widened his social and academic horizon and at the same time gave him insights that were to affect his view of life. However, after a year, Achebe dropped medicine for English and History losing his scholarship for a while. The decision displeased his parents but for Achebe it was a moment of self-discovery and development. He became engrossed with the works of Thomas Hardy and A.E Housman. "What happened to me was Hardy's sense of reality, " he recalled. "I think that the things that really make the world, the human world, are the serious, the tragic. This is roughly what Hardy says to me; this is what Housman says to me." At Ibadan, Achebe also developed as a literary critic. He openly lambasted Joyce Cary's Mr Johnson as reinforcing the colonial image of Nigerians and Africans. He was often reprimanded for some of his anti-colonial postures. He also edited the university magazine where he was able to showcase his poetry skills. He was particularly known for his limericks. Much to his disappointment, Achebe graduated in 1952 with a second class lower degree, while his application for postgraduate studies at Trinity College, Cambridge was subsequently rejected. After some few months teaching at a secondary school, he joined the Nigerian Broadcasting Corporation in Lagos on the recommendation of his university tutor. He was the station's first Nigerian producer. Achebe sampled the sounds and sights of Lagos' nightlife and its elite social clubs. Always smartly dressed and driving a jaguar, he personified the image of the up and coming new nation, emerging with confidence from a century of colonialisation. Some of the scenes in his second novel, No Longer at Ease, were clearly informed by his experiences of 1950s’ Lagos. It was also at this period that Achebe began work on Things Fall Apart. As a budding novelist, there was no role model then that he could emulate, since there were few African writers. The book that he was writing was therefore something of a pioneering project. In 1956, while on a BBC-sponsored training course in London, Achebe was persuaded to show his manuscript to Gilbert Phelps, a senior staff at the corporation who was also a published novelist. Phelps was impressed and told Achebe he had written a very good novel. His commendation boosted the confidence of the young Nigerian who had been reluctant to send the manuscript off to publishers. Achebe returned to Nigeria to complete the manuscript and he sent his only copy to a London-based publisher. This action was rather foolhardy as he the manuscript was ignored and left to gather dust until the intervention of one of his friends. Achebe later said he would have given up the dream of becoming a novelist if the manuscript had been lost. Things Fall Apart was published in 1958 and was critically acclaimed. It won the Margaret Wrong Memory Prize soon after. His next novel, No Longer at Ease, which was originally part of his first, dealt with the new reality of a newly independent Nigeria. Obi Okonkwo, grandson of the protagonist in Things Fall Apart returned to Nigeria after university education in Britain but found himself bearing the burden of his people's expectations but his exposure to Western culture has distanced him from the traditional ways of his own people. In 1961, Achebe married Christie Okoli, the same year that he won the National Trophy for literature donated by the then Governor-General of Nigeria . In 1964, Arrow of God was published. Benedict Nightingale, the Guardian reviewer commended the novel's "unsentimental evocation of a rich, vital way of life that really satisfies those lucky enough to be born in it." The novel was awarded the first Jock Campbell - New Statesman Award in 1965. Meanwhile, Achebe' career at NBC was on the rise, he was promoted the first Nigerian director of external broadcasting and also given a mandate to establish Voice of Nigeria. He also won a UNESCO fellowship to tour the United States, the trip gave him the opportunity to interact with notables African American writers like Langston Hughes, Ralph Ellison and James Baldwin. His busy work schedules was compounded by his being made the editor of the newly created Heinemann's African Writers Series - a role for which he was not drawing a salary. As editor, Achebe helped publish the works of new and old writers like Ngugi wa Thiong’o, Cyprian Ekwensi, Christopher Okigbo and Olaudah Equiano. He was also the founding father of the Mbari literary movement and the defunct Society of Nigerian Authors. Achebe's next novel, A Man of the People, succinctly predicted Nigeria's first military coup of 1966, which culminated into a civil war. The novel ended with a military take-over of a corrupt civilian government by painting a creative purge of the rotten political elite. With four successful novels, Achebe now turned his attention into writing children stories, but the 1967's civil war interrupted his next literary voyage. Achebe, now an influential literary giant sided with the newly-formed Biafra Republic, which he served as a roving ambassador. In his new role, Achebe travelled overseas to educate the outside world of the genocide and human sufferings taking place in Eastern Nigeria. His close friend, the critically-acclaimed poet Christopher Okigbo, died in the war along with over one million people of Igbo descent. After the war, Achebe took up a teaching post at the University of Nigeria Nsukka (UNN), where he started another literary magazine Okike, with contributions from many prominent Nigerian writers. In 1971, his collection of poems, Beware Soul Brother was published; he also resigned his editorship at Heinemann and left Nigeria to take up a teaching position at the University of Massachusetts. In 1975, the Scottish Arts Council honoured him with the second Neil Gunn International Fellowship. The following year, he returned to UNN as a professor of English. He hosted eminent figures Like Jimmy Carter, the former U.S president who confessed to be a fan. In 1981, he retired from his teaching position at Nsukka to devote more time to his creative writing and the running of Okike magazine. His next work, The Trouble With Nigeria, published in 1983 was an indictment of the political class and also a criticism of the anomalies in the Nigerian society. In 1990, eminent scholars from across the world gathered in Nigeria to honour Achebe and delivered 150 papers on his Things Fall Apart. He afterward moved to Bard College, New York state, as an eminent professor. In 1989, he was appointed to a seven-person international jury by the Indian Government to award the annual Indra Ghandi Prize for Peace, Disarmament and Development. Tragedy struck a year later; in May 1990, while travelling to Lagos Airport for an engagement in America, he was involved in a car accident, which left him wheelchair bound. Despite the accident, Achebe continued to travel widely, given packed-out lectures at institutions across the world. He moved from Bard College to Brown University, in Rhodes Island, in 2009 as the David and Marianna Fisher University Professor and professor of Africana studies. A staunch critic of the Nigerian political class, he twice rejected national awards from the Nigerian government in 2004 and 2011, because of the country’s endemic corruption and widespread poverty. "You need to have leaders who feel the need or are compelled by their people to be good and reliable. The failure of leadership is the explanation in my famous piece, if I may so say, ‘The Trouble With Nigeria.’ This is the failure of Nigerian leaders, not their followers." he said in a 2010 interview with Newsweek Magazine. Achebe received numerous awards and tributes in his lifetime, but perhaps the most cherished came from Nelson Mandela who wrote: "There was a writer named Chinua Achebe, in whose company the prison walls fell down." Achebe was an inspiration to generations of modern African writers and many saw him as the father of modern African literature, but he saw his role in literature as resembling that of a missionary. "The whole purpose of African literature in my view is to change the perception of the world as far as Africans are concerned," he said. "So I have been very busy spreading that good news, that Africans are people, that we are not savages and cannibals." He is survived by his wife Christie, their daughters, Chinelo and Nwando, and their sons, Ikechukwu and Chidi. 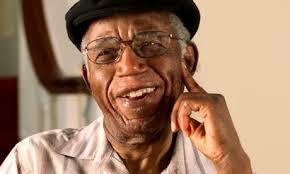 Chinua Achebe, writer, born 16 November 1930; died in Boston, USA, 21 March 2013.